You also have the option of enabling icons for your preferred senders to display in the From field in your message list. From the Address Book menu, select Contacts. In your list of contacts, click the Edit icon for the contact you want to update. On the Edit Contact page, select Add as a Preferred Sender, and then select an icon from the icon list. Repeat these steps for other contacts that you want to designate as Preferred Senders. 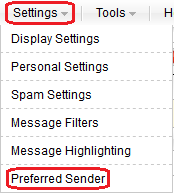 From the Settings menu, select Preferred Sender. In the From field, enter the email address of a person you receive email messages from whom you want to designate as a Preferred Sender. From the Icon list, select an icon to display for this preferred sender. From the message list in your Inbox, open an email message from a sender that you want to add as Preferred. In the Message Detail area, next to the From field, click Add as Preferred Sender. In the Preferred Sender window, verify the email address is correct and select an icon to display for this preferred sender. How do I retrieve my email messages if I manage my DNS elsewhere?